Never has the Nindie round up seen such diversity in its games. A real medley of genres here with the SSX-inspired Snowboarding: The Next Phase, a somewhat clunky, yet still altogether enjoyable dungeon crawler in The Keep, some fast-paced and frantic retro fun with Horizon Shift ’81, well thought out and beautifully executed puzzling in Samsara and finally, a two-for-one platforming deal in the fantastic Gunman Clive HD Collection. Plenty for you lot to sink your indie teeth into this week, then. Starting the standard high up in the snowy slopes, Red Bull has taken another dive into the gaming with Snowboarding: The Next Phase. This arcade-style snowboard sim boasts some really great features, a solid multiplayer mode and some well-devised controls – either using both Joy-Con, or just the one. 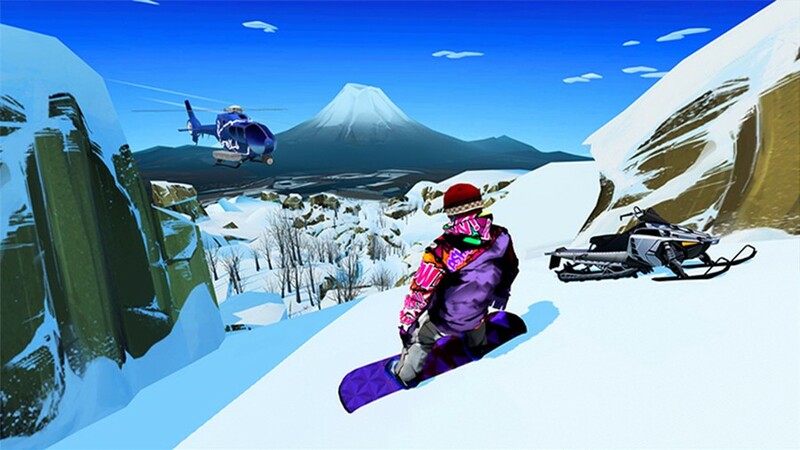 With the SSX series in hibernation since its attempted reboot in 2012, this chilly board sim will be a treat for snowboard enthusiasts as not only a nostalgia trip, but an enjoyable – if simple – experience. The amount of content is impressive in Snowboarding The Next Phase. Don’t be fooled by its generic title; the plethora of unlockables gives it great depth. Additionally, its generous levelling system strikes a good balance, though perhaps slightly erring on the easier side. Progression in Career mode is based on the completion of individual missions, with each map broken down into a handful of substages, each boasting their own tasks. This makes for a fairly lengthy campaign mode that offers organic, earned progression. The missions are mostly your run-of-the-mill tricks or item collecting, but the variety is sufficiently satisfying. There are also separate missions available in arcade mode to try your hand at in a more casual environment. Levelling-up by completing these will give you access aforementioned unlockables, including alternate costumes, boards and other vehicle set pieces which can further enhance your score multiplier. The controls are tight and fairly forgiving. Stacking it will lead to an instant get-up, with the penalty being to your score, which is a nice addition to attempt to keep the gameplay pacey; there’s no Lakitu to waste time picking you up here. The tricks have decent variety, though the overall speed of the actual boarding could be a little quicker for our tastes. Snowboarding The Next Phase takes heed of its genre . ancestors for its visual cues, with a stylised aesthetic reminiscent of SSX Tricky and arcade titles like Crazy Taxi. Overall, it’s a surprisingly deep and addictive game, especially in local multiplayer mode. While not the most intense sports game in the world, what it does, it does well. A dungeon crawler with a retro influence, the mechanics of The Keep might seem a tad daunting at first, but once you’re established, it becomes a fairly fun romp that experiments with its tropes; it adds a decent magic system but is hindered in equal measure by a slightly clunky combat system. 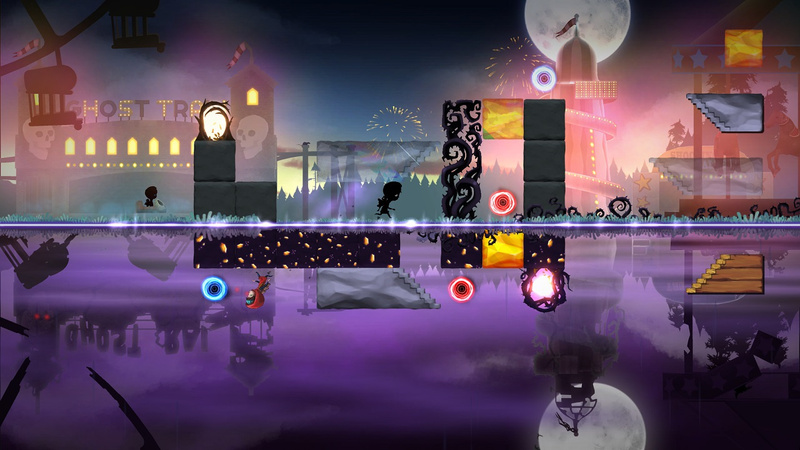 The gameplay is largely a success, with clever level design being a clear highlight. The story, however, is incredibly stock and uninteresting, especially when narrated through poorly-acted cutscenes. Additionally, the decision to make the character an unnamed male avatar without any kind of character creation is disappointing. The objective of each level is your standard dungeon crawler fare, as you defeat enemies to reach the dungeon’s end while collecting as much gear and collectables as you can for the next stage. Helpfully, The Keep gives you the opportunity to go back and clean up anything you might’ve missed the first time over, telling you how many items, enemies and other objectives remain when you reach its end. As for the interface, the use of pop-up windows for your magic, map and inventory is a great feature that allows for hotkeys that make for a much simpler alternative to continuously pulling up the main menu. However, many of The Keep’s best features tend to feel like they’d be optimised for PC and the use of a mouse. This becomes clear during combat, which opts for a real-time, line drawing model, as opposed to other crawlers like Crimson Keep, which we reviewed previously, that takes a more contemporary approach. This makes combat feel a little stilted, though crucially, not unplayable once mastered. Perma-death can also be toggled on at the start of each playthrough to offer a variety of challenge to more seasoned crawlers. However, the offer of only one save slot is frustrating. 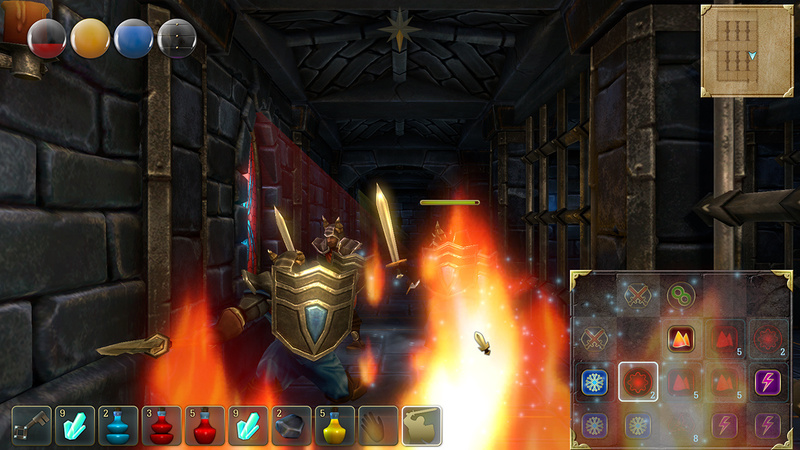 The Keep’s aesthetic is simple, paying homage to its retro influences, such as the legendary Dungeon Master. The graphics are basic but serviceable and aid the nostalgic, retro vibe it aims for. The sound design is again, fine, but nothing spectacular, with fairly stock sounding musical choices. 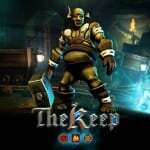 Overall, The Keep is a fine dungeon crawler. Not the best in its league, but mechanically sound, if a tad sloppy in places. There is a great game in here, but its mediocre story and the occasional poor design decisions make it best left for true crawler enthusiasts. 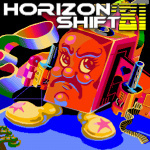 Paying further homage to the Atari days, we have the brilliant arcade shoot ‘em up, Horizon Shift ’81. 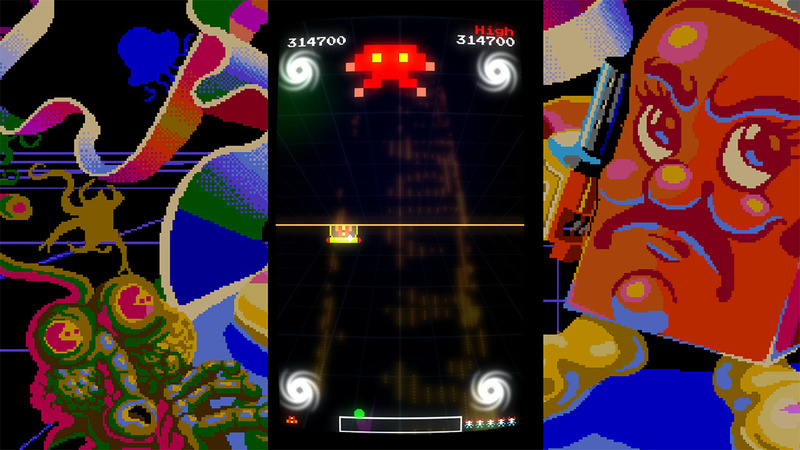 The influence of the ’81 element of the title is clear from the moment you download, with the Atari-inspired game art adding a nice touch. This shmup has you take control of a ship protecting a central line from threats on both sides, with the ability to move beneath and above the line, creating double the chaos. It’s a blend of various titles, but most prominently brings to mind Space Invaders and Asteroids, with the huge bosses of more contemporary shmups. Gameplay is pretty standard fare, but the twist of shifting between different sides of the horizon as well as the ability to jump injects a unique freshness. The power-ups are also standard fare, but feel suitable and are given regularly enough to feel fair, although not so often that you feel boringly overpowered. As with many shmups, not all power-ups are created equal and there will be times when you actively avoid the shotgun whilst raining bloody murder on your enemies with your spread gun. You also have the ability to fill up a ‘bomb bar’ at the bottom of the screen, which launches a devastating screen-spanning attack once activated. All of this makes you a powerful force, but is balanced by one-hit deaths. The difficulty can also be affected by the various modes on the title screen, all of which up the ante by removing lives and checkpoints to eventually create a cripplingly difficult experience. The retro look of Horizon Shift ’81 is gorgeous, with the Atari-style sprites providing vintage nostalgia while simultaneously looking sharp, sleek, and modern. The decision to have the screen size minimised to emulate the feel of playing on an arcade machine is also a great touch. Overall, Horizon Shift ’81 is a great time. A unique, fast-paced shooter that oozes enthusiasm and passion, in addition to the appropriate level of respect to the games of years gone by. Oh, and the soundtrack is just banging. Some proper techno goodness that’ll get your blood pumping for those boss fights. Samsara is a puzzler with a unique premise that weaves the narrative and characters into its rudimentary gameplay effectively, presenting a charming indie experience. You take control of Zee, a young protagonist thrust into an ‘upside down’ land that mirrors the world above. You in turn guide Zee through by placing platforms for him to walk over in order to reach escape portals. The premise is surely more than a bit influenced by a certain popular Netflix show, yet that isn’t the strangest thing on display here. Later levels can become fiendishly difficult, encouraging an enjoyable amount of out-of-the-box thinking and clever problem-solving. 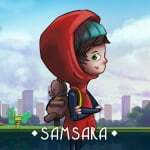 Behind its cute and cuddly exterior, Samsara offers some really great puzzling, that often leads to satisfying moments of personal validation once solved. Though the premise of stacking stairs and crates to use as platforms may seem super basic, the game manages to keep it interesting, with an appropriate difficulty curve and clever use of the mirror image function. Some moments will have you wanting to throw your Switch to the ground in frustration (please, don’t do that), but the joy of solving one of the later, fiendishly hard puzzles is incredibly rewarding. Though initially somewhat underwhelming, the visual style of Samsara becomes more appealing over time. The choppy, almost lazy initial cutscenes are not reflective of the level design, which becomes hauntingly beautiful when combined with the dark, mirror image below. Zee also becomes an endearing protagonist, as you become more and more aligned to him and want to see him escape. Samsara is, unfortunately, let down by a shockingly empty soundtrack that makes much of the game lack a distinct aural style, which is a big hit against its overall aesthetic. However, this is still a great puzzler. Its delightful visual style and simple yet tough puzzling make it appropriately addictive and something quite special. It’s two for the price of one with the original Gunman Clive and Gunman Clive 2, rolled into one pistol whippin’ HD package. Though it contains both the original and the sequel, the latter is incredibly similar to its predecessor, with the same characters, setting and art style, albeit with a splash of colour and larger action set pieces from the get-go. Think of Gunman Clive 2 as the big budget movie sequel to a surprise indie hit. It ups the ante with some crazy new mechanics later on in the adventure, but keeps the spirit of the original alive via the core gameplay remaining essentially the same, with some welcome additional features. The platforming here is top notch, though in places and on greater difficulties, hard as nails. Taking from the NES Castlevania and Mega Man school of thought, Gunman Clive and his allies are unable to aim diagonally (something that enemies can do) and also fall victim to push back from every foe, leading to some frustratingly unfair deaths. Power-ups are also generously given on most stages, however, leading to at least some balance. You’ll also find that playing different characters offers slight benefits and detriments, a la Super Mario Bros. 2. In fact, this influence is very clearly seen in the character of Ms. Johnson, who gains the same hover ability as Princess Peach, along with a slower walk animation due to her amusingly long dress. This leads to some great variety and allows players to experiment their favourites, and there are additional characters to unlock along the way, too. Later stages also mix up the action with levels involving beast riding and vehicle-based shooting, to name just two. 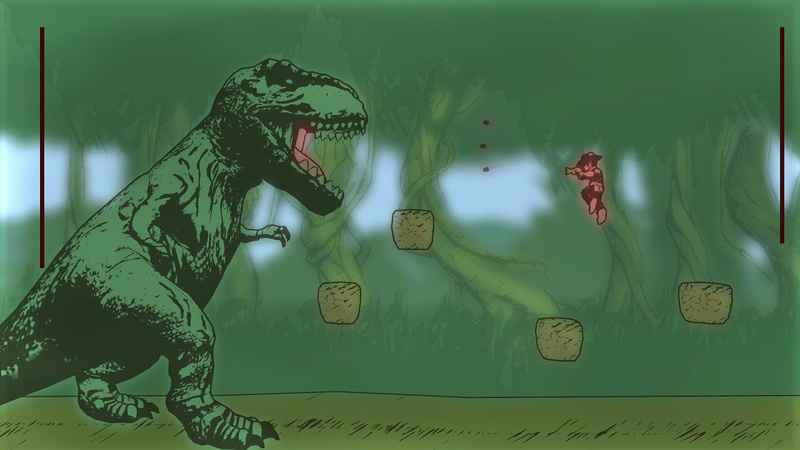 The aesthetic of both Gunman Clive and its sequel are strong, sporting an unapologetically retro, hand-drawn vibe. The first game suffers from a few of the backgrounds being a little too bare, but this is rectified in the colour infused, stylised sequel which offers far more detailed environments. The music and sound effects in both are also top notch, creating a classical western atmosphere balanced with an enjoyably upbeat choice of music. 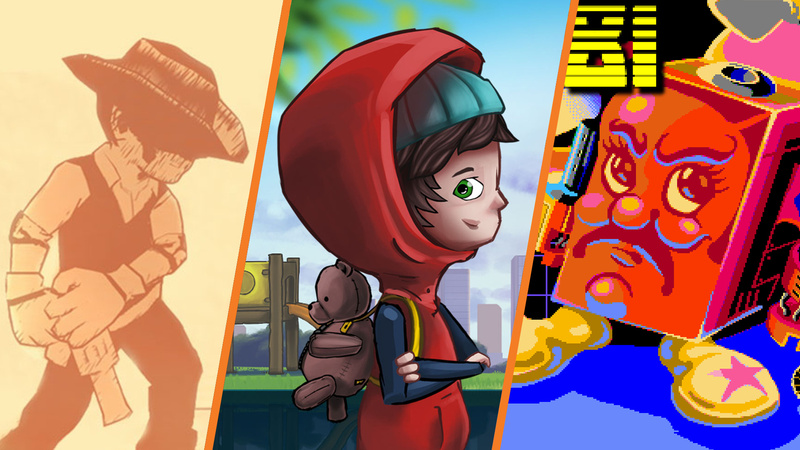 In review, the Gunman Clive HD Collection offers some really great indie platforming and to get both games in one neat package; it’s a must-have for platformer fans. I like this feature. Good summaries on all the games. Samsara = Saṃsāra in Buddhism is the beginningless cycle of repeated birth, mundane existence and dying again. Samsara is considered to be dukkha, unsatisfactory and painful, perpetuated by desire and avidya, and the resulting karma. I appreciate that you guys do this now for some of the seemingly endless weekly indie releases. Question/suggestion. Perhaps include a trailer rather than the photo for each of these games? 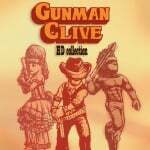 I know Gunman Clive collection is a very affordable download title, they always have been, but it's something I'd like to perhaps own physically one day. Would be even cooler if it includes that one-level Game Boy version of Gunman Clive! I’ll buy Gunman Clive at that price and I’d buy again if it gets a physical release. I really enjoyed The Keep when I played it on 3DS. Though to be fair, using the magic system was a breeze using the stylus on all the runes in the bottom screen. Not sure how well that translated to the Switch version. Gunman Clive is a pure delight, and ESPECIALLY considering the super low $3.99 price point. So cheap you could mistake it for shovelware. Nothing that particularly excites me in this lot. I'll wait and see on Snowboarding The Next Phase. Couldn't get into Gunman Clive on the 3DS but maybe I'll give it another chance if it goes on sale at some point (I know it's already pretty cheap but still). I have Snowboarding: The Next Phase. I've been playing it more than some other more expensive titles. Its fun, its made for pick-up and play and it is overall very well made. I've been playing Gunman Clive on Switch all weekend. I previously had it for 3ds. The Switch version looks great and plays great. @Anti-Matter And the goal of every conscious being (Buddhist perspective) is to exit the cycle of Samsara by becoming enlightened - one's own individual Buddha; thus, no longer needing to traverse the cycles of life and live in a state of Maya (illusion). Thanks for these great mini reviews of indie games, excited to try out Gunman Clive in HD after enjoying the first one on 3DS. 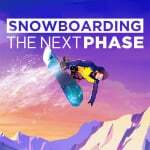 I got Snowboarding the Next Phase because I am a big fan of snowboarding and it's cheap. It's an alright game I guess, a bit better than I thought it would be, but it's definitely no SSX. The game is all about short runs and getting a high score and it has a bit of a mobile feel to it so I wouldn't rate it too highly, but it isn't bad. Gunman Clive is the game I will purchase next week.